This week, far sooner than anticipated, the Transportation Security Administration (TSA) began implementing new enhanced airport security procedures for electronics. The new procedures, rolling out over the next few months at airports across the U.S., will enhance scrutiny of passengers' carry-ons, on both domestic and international flights. Travelers in standard TSA checkpoint lines will have to remove all electronics larger than cellphones from carry-on bags and place them in separate bins with nothing else above or below them, for X-ray screening. Travelers in TSA PreCheck lines will be able to leave their large electronics in their bags as they do now with laptops. The enhanced security affects leisure travelers who have camera gear to photograph their vacations and professional photographers alike. Along with laptops, tablets, games and other large electronics, photography gear such as cameras, camera bodies, flash units, portable hard drives, battery chargers, etc., will have to be taken out of photo gear bags and carry-ons, then placed in bins for X-ray screening. Cameras and other photo gear must also be removed from cases, wraps and pouches before they are placed in bins. Many photographers use interchangeable lens cameras and bring multiple lenses on their trips. Many lenses for digital single lens reflex cameras (DSLRs)and mirrorless cameras are expensive and more fragile than the cameras themselves. So, contrary to earlier reports, while cameras and camera bodies larger than a cellphone must be placed in bins for x-ray scanning, at TSA airport security checkpoints across the U.S., photographers may keep their lenses in their photo gear bags and carry-ons. Here are my tips for air travelers to minimize potential problems at TSA airport security checkpoints. They should help travelers avoid delays from re-screening and hand screening of their carry-ons and belongings, as well as avoid problems due to ETD false positives. Know the rules:TSA has many rules about what may or may not be packed in checked luggage and carry-ons, and what is prohibited overall. TSA's liquid rules remain unchanged. Stick to the rules. Don’t try to sneak anything past TSA. It’s not worth it, especially at this time. Pack your belongings in layers. Put anything with wires (electronic gear, etc.) in one layer only. This permits TSOs using X-ray scanners to more easily identify your belongings. Stacking gear makes it difficult for TSA Transportation Security Officers (TSOs) to determine what’s in your bag and will likely result in a hand search. Never pack items with loose wires in your luggage, whether in bags or not. 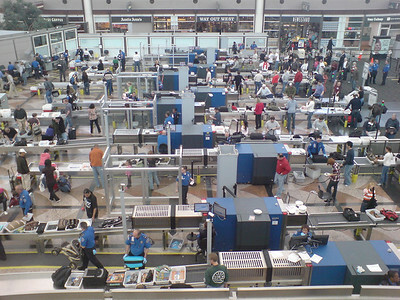 They often appear in X-ray enough like bombs or detonation devices to trigger a comprehensive hand search of your bags. Bundle and tie the wires. Pack your belongings neatly and orderly:Pack all small items in see-through bags to maintain orderliness and make it easy for TSOs to identify your belongings in X-ray and hand check searches. It also helps you keep track of your belongings when removed by a TSO during hand searches. Fully charge your electronic gear so they can be turned on:At times, TSA TSOs may require you to prove your electronic devices are what they appear to be. Fully charge your electronic gear so they can be turned on if required. Have a memory card in your digital camera to take a photo at security, if asked. Prepare for airport security to use Explosive Trace Detection (ETD):TSA has used ETD (Explosive Trace Detection) for years to check if passengers are carrying explosives. EDT is when TSOs swab you and/or your gear, then scan it for explosives. Unfortunately ETD equipment has a long history of producing false positives, indicating traveler's who have never handled explosives, did so recently. More often than not, glycerine is the culprit, though anyone with a heart condition who uses nitroglycerine, farmers who handle fertilizer or law enforcement officers or hunters who handle ammunition can also be the victim of false positives. You might not have ever heard of glycerine, but it's an important component in body washes, soap, sanitizers, hand lotions, baby wipes and other personal care products. It's found in the hand soap of many airport lavatories. Even in trace amounts, glycerine can read “explosive” in an ETD scanner. If glycerine is on your hands it can rub off on to your luggage, contaminating it too. To minimize ETD false positives, discontinue using products containing glycerine within 48 hours of flying, as it takes a while to wash or wear it off. Don't handle your luggage if you've recently used a product containing glycerine. Enroll in TSA PreCheck or Global Entry:If you're a U.S. national, fly more than once per year and carry electronics and photo gear on your trips, consider enrolling in TSA PreCheck, a trusted traveler program. The new enhanced security procedures aren't used in TSA PreCheck lines at airport security. PreCheck costs $85 for a five year membership. If you travel internationally, consider Global Entry to smooth your reentry into the U.S. Global Entry entitles you to use TSA PreCheck. Global Entry costs $100 for a five year membership. These tips aren't foolproof, but they can help you avoid delays at airports from re-screening in X-ray or by hand, ETD false positives and lengthy questioning. You've scooped everyone on the information about lenses. Several articles I read said that lenses had to be removed from our bags. You found out we can leave our lenses protected in our gear bags. I had read that I was going to have to take my lenses out of my gear bag. Thanks for clearing up that mistake. It's a relief that we can keep our lenses protected in our bag. Another great article. Thanks for clearing up the mystery about lenses. Thank goodness we don't have to put them in bins. I'd hate to see some TSO drop my 500mm on the floor. It wouldn't survive. What a huge relief that lenses can stay in our bags. I thought we'd have to take lenses out of our bags and put them in bins for sure. Thanks for the info. PDN and DPReview are reporting that lenses have to be taken our bag and put in bins. Are you sure that's not true? I saw the PDN article, which was from DPReview, by the way, while I was working on my article, and another I'm writing for a travel website. I didn't read the information from DHS and TSA in the same way that the author of the DPReview article did, but whether or not lenses were included wasn't clear. That's why I waited to write my article until today, after I was able to contact TSA directly this morning, and ask them about lenses and the new enhanced security directive. In answer to my query TSA was unambiguous when they stated that lenses don't have to be removed from our bags and placed in bins. So yes, I'm sure about this. You're on top of the news as always Ned, especially when it comes to photography and travel. Thanks. Very happy I don't have to take my lenses out when flying. I sure don't want some minimum wage TSA flunky handling one of my $10K+ cost lenses. I can see it now, crashing to the floor. Great reporting. Many websites report that lenses may be subject to the new TSA electronics rules, because they didn't ask TSA about them, but you did and found out TSA policy is that lenses aren't considered to be electronics by TSA. Thanks.